That would be so gross, but would you watch it anyway? Who wouldn't be in that situation? WOW - only just turned 24 and heading for your second WDC !! Happy Birthday "Baby Schumi" .... "Alles Gutes zum Geburtstag" ! Be warned, historically on this forum, very successful drivers become hated. Should be calmer for Vetts now that we (temporarily I hope) have less forumers. Mind you, that childish behaviour is probably why we have less forumers!! I agree lightmas..I do love Seb's sense of humour one of the reason why i like him...hope he had a great day!! Tough race for Seb. However finishing 2nd is not bad.. not bad at all. Would he win at home for the first time.. I am betting he will. arizal_adl a écrit: Would he win at home for the first time..
Vettel takes 2011 WDC F1 title!! CONGRATULATIONS SEB - WELL DONE !!!!! SEHR GUT GEMACHT JUNGE !!! 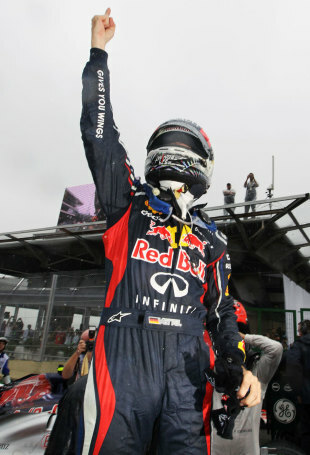 Schuy1 a écrit: Vettel takes 2011 WDC F1 title!! Congrats. Well deserved. He has been unbeatable for pretty much the whole year. PS: Thank you Seb !! Another fine drive in India. I thought Seb spoke very well at the Drivers' interview after the Podium presentations. He is not only VERY fast, he also has a level head and is showing great maturity for a 24 year old. WELL DONE AGAIN BABY SCHUMI !!!! Hope its not too late to wish.. Congratulation Champion..
That was heroic drive... F**k.. That was his best drive as far as I can tell. Superb drive in Abu Dhabi! Let me be the first to congratulate the 3xWDC..
Its as many as Senna, but it feels like he just got here lols.